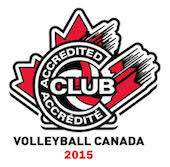 The OVA and Volleyball Canada have made some modifications to the eligibility rules over the past few seasons with expanded age groups. In response to (and in support of this initiative) the Maverick Volleyball Club has reviewed our practices and has put in place a mechanism for the processing of these requests. After review of our tryout process in 2016, we have implemented changes to our tryout process for 2017 in an attempt to make it more manageable and to ensure that players are placed at the most appropriate level. Click here for more details on playing up or playing down.